Do you want to rule the world one day? You should start by building your own robotic minion! Whether you want to become a tinkerer of gizmos or an arch-engineer wizard of larger-than-life mechatronics, our kits are a great way to get your feet wet and continue learning the skills you'll need to wield technological greatness. Even if you're a seasoned creator, let our robots be a point of departure for your own creative ventures! 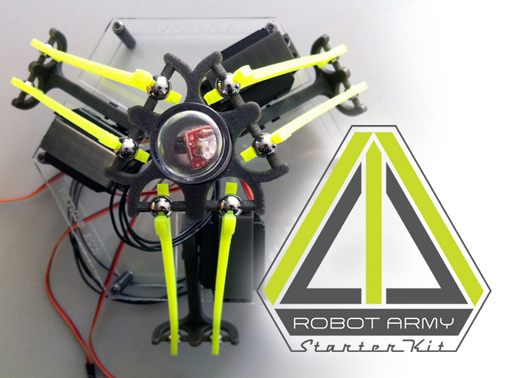 Our delta robot kit is fun to build, sharp to look at, and a great way to develop an understanding of the delta robot type! Mark and I are using this model in our massive robotic installation, Light Play. Along the road, we're coming up with a lot of interesting demos that involve all sorts of peripherals, like the Xbox Kinect, Leap, and facial recognition. The code we develop will be open to use so that you can try it out too. strength The robot is able to lift around 12oz (a can of soda) with its end effector.